A quick recap for those unfamiliar with TCAS. The Traffic alert and Collision Avoidance System (TCAS II) helps to protect aircraft from hitting each other, so is a Good Thing. Please don’t ask me what happened to TCAS I or the differences between versions 6.04a and 7.1 etc. I’m not a TCAS expert. If you want to dig deeper, I can recommend the excellent FAA document on the topic. Aircraft protected by the TCAS system repeatedly send out messages declaring their altitude, heading and speed. The aircraft then listens for messages from any other local aircraft and can work out from the relative bearing and closing speed how long it might be for the other aircraft to come closest to them (or possibly hit them!). 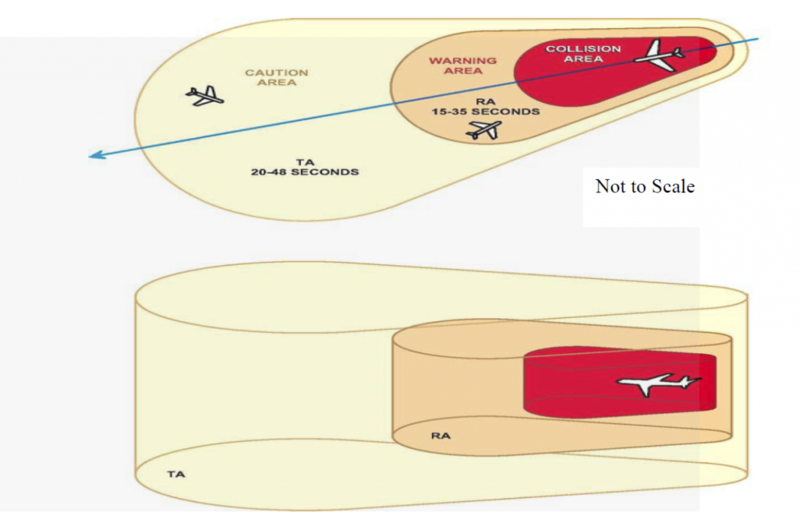 Depending upon the closing rate, a caution, warning or possible collision decision is made by the system in each aircraft. Here’s a picture to paint a thousand words. Now, the first level of alert is called a Traffic Advisory (TA) and the closer aircraft are subject to a Resolution Advisory (RA). Normally for two TCAS equipped aircraft, they will both raise TA or RA alerts at the same time as the gap between them is closing at the same rate. The TA informs the pilot that there is an aircraft nearby of which he needs to be aware. There are displays in the cockpit to show him where the conflicting aircraft is. At this stage the pilot should check he has lights on and look out for the aircraft, but not make any change in flightpath. The RA requires the pilot to take some avoiding action which may be to climb or descend, or sometimes to maintain the current flight path. The algorithms ensure that one aircraft climbs and the other descends to ensure a safe space between them. For all TCAS equipped aircraft, the flight data recorder saves basic information about the TCAS RA exchanges and in particular shows whether the pilot was advised to climb or descend. We are therefore able to see whether the pilot took the correct action, and, if so, how swiftly he did so. We can look at TCAS RA monitoring in a future blog. A second question is how often do TCAS TA alerts arise, and here we run into a problem. The FDR regulations require aircraft with TCAS to record “…the status of Combined Control, Vertical Control, Up Advisory, and Down Advisory”. This means that only RA alerts need to be recorded. Now things get a bit confusing. Many modern Airbus aircraft record TCAS TA signals, which is beyond the mandatory minimum, while some older models do not. Conversely, most Boeing aircraft comply with the requirements but do not record TCAS TA alerts as they are not required to do so. There are then Boeing or Airbus aircraft operated by airlines who chose to configure the recording systems themselves. They sometimes add TCAS TA signals to the non-mandatory recorder signals that are available for flight data monitoring. Other manufacturers do different things on different models, probably influenced by the capacity of the recorder being installed at the time of certification (I’m guessing at this stage, and have no evidence to support this wild assumption). While it is possible to make thorough system-wide studies of the performance of TCAS Resolution Advisory (RA) alerts, it is not possible to make such a thorough analysis for Traffic Advisory (TA) alerts as the recordings are heavily biased by manufacturer and so liable to be biased towards operators flying Airbus types.